Two months ago I said that worry over March’s “weak” jobs growth report of just 88,000 new jobs was misplaced – that preliminary estimate was likely to change significantly. It did get adjusted – first to 138,000 and then to a final 142,000. You really don’t need to hear it from me again, but the same caution must apply to today’s moderate report of 175,000 new jobs. Why? The real issue here is that one number – the national total number of nonfarm jobs – is a really blunt instrument for assessing the state of a vast economy. For one thing, it misses a whole host of other indicators critical to the health of the jobs market - the unemployment rate, the labor force participation rate, or the effectiveness of safety net programs like unemployment insurance, for example. 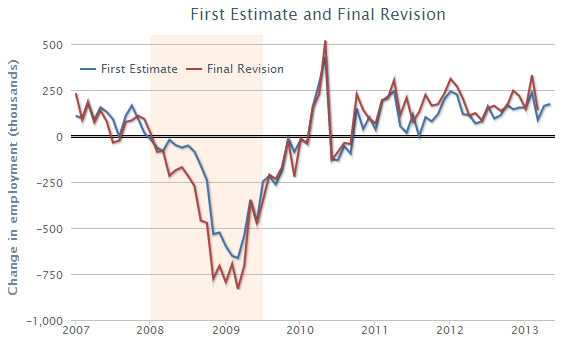 Assessing true economic recovery (or decline) requires a more nuanced approach. With the exception of the government and manufacturing sectors (manufacturing was a bright spot early in the recovery), there has been steady (if anemic) national growth across most of the economy – total private jobs, services, financial activities, goods production, and health care and education – indicating resilient growth that’s not over-reliant on any one industry (housing construction, for example). But that’s still not the whole story. 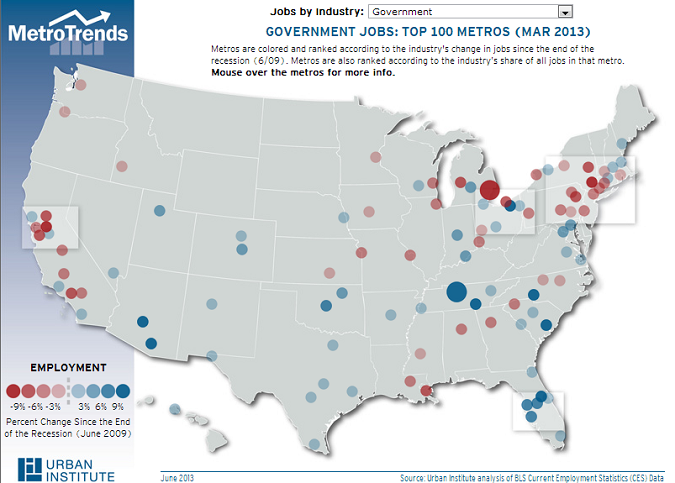 As the interactive map above shows, some parts of the country are recovering from the recession better than others. Albuquerque, for example, has lost jobs since the end of the recession in every sector except government and health and education. Regardless of the strength of today’s jobs report, Albuquerque’s economy is struggling. In contrast, Austin, TX has gained jobs in nearly every sector since the end of the recession, indicating a more robust and balanced recovery. In general--but not always--Southern and Midwestern metros have gained jobs across sectors, while some Western and Northeastern metros have struggled. A final thought: the economy could theoretically gain many jobs each month without a drop in the unemployment rate (due to population growth) or the unemployment rate could fall with no gain in jobs (as discouraged people give up looking). Looking at just one number rarely tells the whole story.